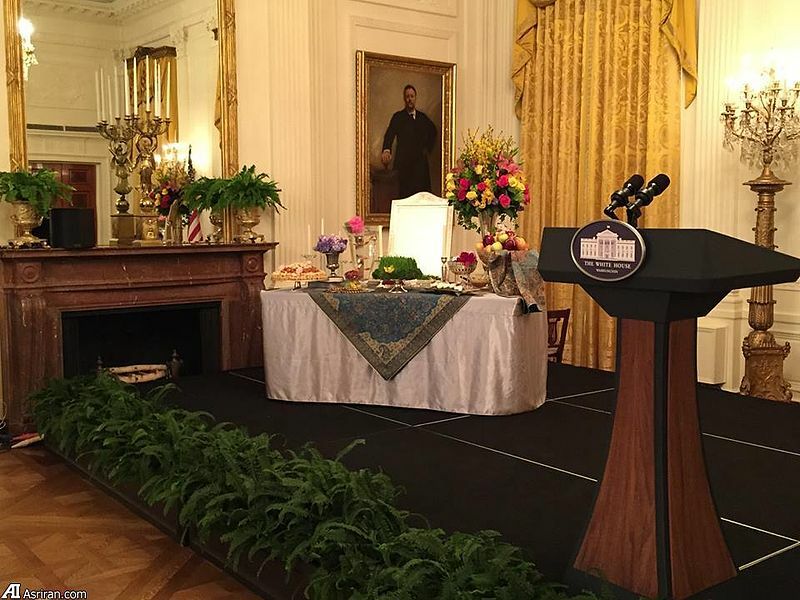 This week, Michelle Obama hosted the second annual White House Nowruz, a celebration of the Iranian New Year. Though a relatively apolitical affair, the placement of the reception's traditional haft-sîn, however, should have raised some eyebrows. Nowruz, which literally means "new day" in Farsi, is an ancient festival of new beginnings, deeply rooted in Zoroastrianism, celebrating the first day of Spring and the Persian calendar. Of the myriad traditions and festivities associated with Nowruz, the most universally recognizable may be that of the haft-sîn (هفت سین‎), a table arrangement decorated with seven (haft) items – each beginning with the Persian letter S (sîn) – and symbolizing renewal, reconciliation, good luck, and prosperity. 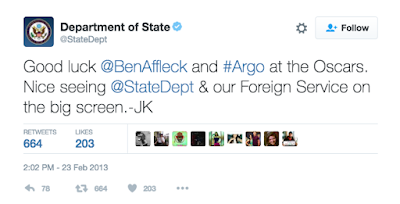 The shindig, MC'ed by comedian Maz Jobrani and catered by renowned Persian chef Najmieh Batmanglij, was held on April 6 – a few days after the official holiday season (which lasts roughly 13 days) had actually ended. 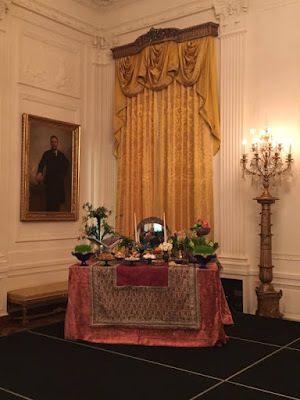 The White House, naturally, had its own haft-sîn on display at its Nowruz party. However, its location in the East Room, where the celebration has been held both years, was a bit curious and (probably) unintentionally laden with symbolism all its own. 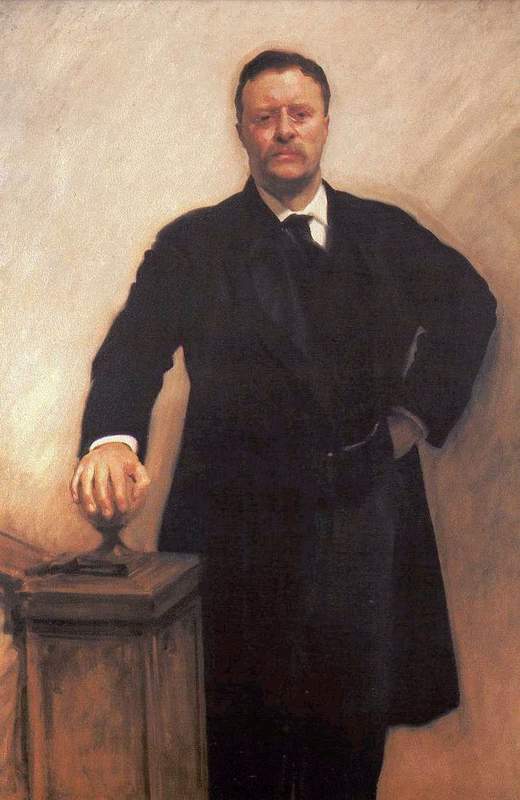 The table containing such traditional items as wheat grass (sabzeh), garlic (sīr), vinegar (serkeh), apple (seeb), wheat germ pudding (samanu), sumac berries (somaq), and dried fruit (senjed) was placed - as it was last year as well - right beneath John Singer Sargent's 1903 presidential portrait of Theodore Roosevelt. One of the principal promoters of American imperialism at the end of the 19th century and in the first decade of the 20th, Roosevelt once wrote, "I should welcome almost any war, for I think this country needs one." Roosevelt's belief was, as he told the Naval War College, "No triumph of peace is quite so great as the supreme triumph of war." 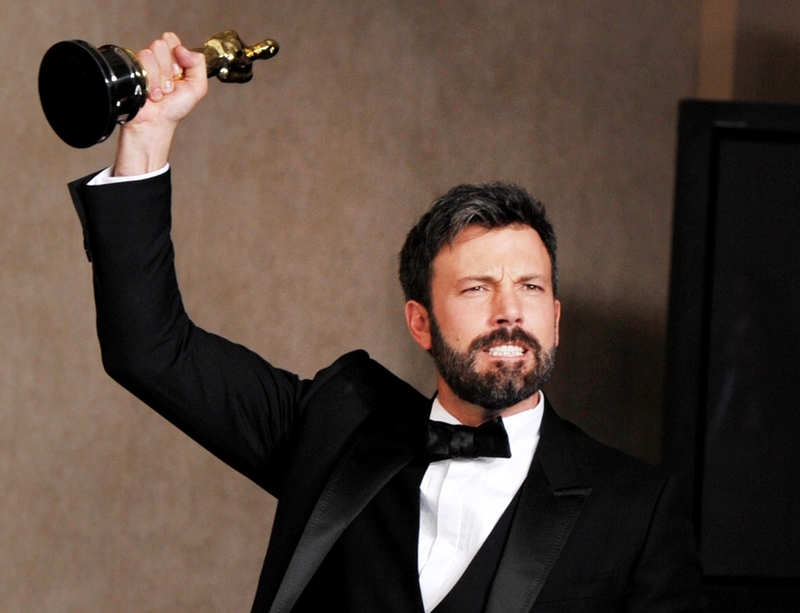 It is said he carried around a list of six target nations on three continents. In December 1904, Roosevelt issued his official Corollary to the Monroe Doctrine, declaring that the United States would not hesitate to use what he called its "international police power" to destroy and replace regimes deemed hostile to American interests. Though initially used to justify military intervention, invasion and occupation of Western Hemisphere nations such as Cuba, Nicaragua, Honduras, Haiti, and the Dominican Republic, Roosevelt sent a similar message to the entire world in late 1907, when he deployed the nation's Great White Fleet to circumnavigate the globe in a show of American power. The fleet consisted of 16 battleships and support vessels, crewed by 14,000 sailors. It sailed for 14 months, covering over 43,000 miles and made twenty port calls on six different continents. Just as it is common practice today for U.S. presidents to deliver Nowruz remarks to the people, and sometimes leaders, of Iran, in the late 19th and early 20th centuries "American presidents were encouraged to exchange telegrams with the Shah of Iran on the occasion of the Persian New Year's Day." "In 1902," note scholars Kamran Scot Aghaie and Afshin Marashi, "President Theodore Roosevelt even presented the Shah of Iran, Muzaffar al-Din, and his brother, Zill al-Sultan, with a copy of his book, Hunting Trips of a Ranchman, recognizing that hunting was a favorite pastime of the Persian royal family as well." 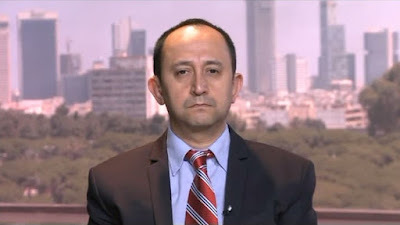 At the time, Iranian leaders saw the United States - which had no imperial presence in the Middle East at that point - as a potential non-interventionist ally against persistent Russian and British encroachment on Iranian sovereignty. Following the Iranian Constitutional Revolution in 1906, Russia and Britain both occupied Iran in 1907 in an effort to dissolve the parliament and prop up the waning Qajar dynasty, dividing the country between them until 1911. Roosevelt remained neutral, however, a position subsequently maintained by Taft and all successive U.S. administrations through World War II, when Russia and the United Kingdom again invaded and occupied Iran to secure wartime supply routes for the Allied Powers and replaced the then Shah, Reza Pahlavi, with his son, Mohammad Reza Pahlavi. 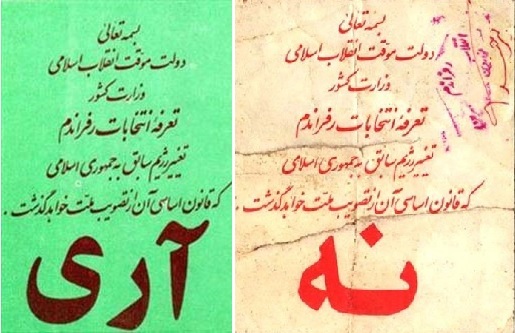 On August 19, 1953, Iranian Prime Minister Mohammad Mossadegh was overthrown in a military coup planned and orchestrated by the United States and Britain after nationalizing Iran's oil industry. Pro-Shah riots were staged, hundreds were killed, newspapers supportive of Mossadegh were ransacked and shuttered, and the prime minister was arrested and tried for treason. The main architect of the coup, executed at the behest of British petroleum interests and under the guise of pro-active anti-communism, was the chief of the CIA's Near East and Africa division, Kermit Roosevelt, Jr. - grandson of President Teddy Roosevelt. 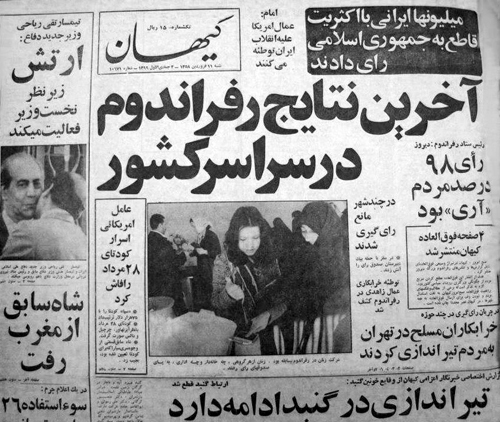 The ouster of Mossadegh, and the reinstallation of the Shah, by American intelligence operatives is a seminal moment in Iranian history and political consciousness, setting the stage for a quarter-century of tyrannical dictatorship propped up by torture, corruption and U.S. military aid, as well as establishing the United States as an interventionist power in the region. 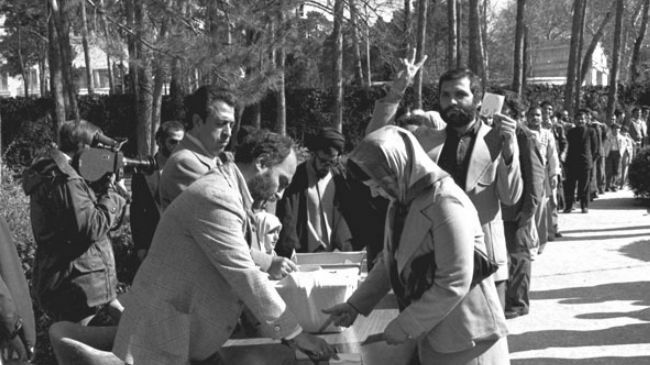 Popular backlash against the Shah, and his American backers, culminated in his overthrow by the Iranian Revolution, and the establishment of an Islamic Republic in 1979. 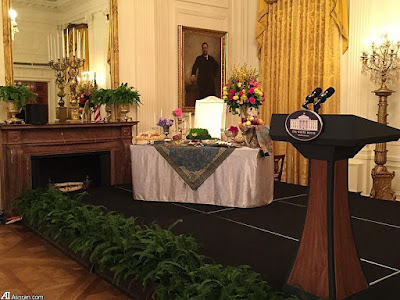 By honoring Iranian culture with a haft-sîn table set under the watchful gaze of Teddy Roosevelt - the godfather of American military intervention and the grandfather of the man responsible for Operation Ajax in 1953 - the White House is unwittingly sending a message of continued hostility and imperial hubris toward Iran. In his annual Nowruz message, delivered right before his historic trip to Cuba, President Obama said that, "even after decades of mistrust, it is possible for old adversaries to start down a new path." At a time when Iran is fully upholding its end of the nuclear accord, while the residual effects of U.S. sanctions continue to cause problems for Iranians, optics remain important. One possible step on the path to better relations would be to move the haft-sîn to the other side of the room.